Licorice Shoelaces Rat Fink Rings Man's Favorite Sport? I suppose that in the telling of all the fun of the 60's, i should also talk about some of the most impacting times that i can remember. many new discoveries happened daily in life, and for me, a wealth of discovery was bestowed upon me through my parents' separation. During the summer of 1964 and my parents' separation, I made regular weekend visits to my Dad in his studio apt. For the most part it was interesting; I made new friends with the kids in that neighborhood and became aware of other new things-one of which was licorice shoelaces. A cramped little space never seemed so lonely, or void of human occupancy as did that tiny studio apartment that rested above the Bob White Theater in Portland. The year was 1964, and that year, the summer, as others, was blazing. There was just enough room for a bed in the main room, and a small dining table in the kitchen area. The bed was one of those old metal rail frames that were so comfortable. At the foot of the bed, was a little black and white TV set. In the afternoons when the sun shifted, the lace curtains threw film-noir shadows across the tiled floor. I watched reruns of "Combat!" on Saturday afternoons. It ran in syndication on channel 2. There was also a great horror movie that I hadn't seen on good old "Alley Cat Theatre" around 6:00. It was called "The She-Creature" and all I can remember about this movie is this vague scene of the creature inside a room of a house terrorizing somebody.The picture on Dad's little black and white TV was bad, so the rabbit ears had to be touching the glass of the window. Nothing was more fascinating to me than my first discovery of "Licorice Shoelaces".These were thin, spaghetti-like licorice strings that tasted like cherry and strawberry. The corner store in our neighborhood didn't carry these, but the little store in my Dad's neighborhood did. Needless to say, I had to stock up big time on these. It was fun to tie them up in a knot and take big bites out of the whole wad. What I can't seem to remember is just how much they cost. I know they were in the penny candy range, but I can't remember if they were three for a penny, or what. Considering how thin they were, and the amount of goodies you could actually buy for a penny back then, I'm sure they were five, or ten for a penny. "Rat Fink" rings came in glorious colors and sold for a dime. Of course, I had to have one in every color available; it just was the thing to do. I eventually bought the Rat Fink model, but it was a serious no-brainer that didn't hold my interest. Around this time period, I was buying and building more "Weird-Oh's" models from Ed "Big Daddy" Roth. Before building "Rat Fink" (which only came in about 5 peices), I had a lot more fun building what I called "Daddy Weird-O". This was a great model from Ed "Big Daddy" Roth. In 1964, I believe the admission price was around 75 cents; that's what the mainstream theaters were charging at the time. I saw some interesting movies here. This theater was absolutely nothing like unfriendly warehouse feel of movie theaters today. The minute you entered the lobby of the Bob White, you were greeted by the ambience of red plush carpeting, Tuscan velvet ropes, dim lighting, and the smell of fresh popcorn. A hallway illuminated only by meager lamp light led to a spacious balcony that overlooked a sea of auditorium seating. Giant curtains hung the hall ceilings seemingly large enough to drape a few neighborhood houses. The curtains reminded you that you were in a special place, more spectacular than most, and believe it or not, located in your own neighborhood. Like many of the indoor theaters of the sixties, the Bob White was a place of guaranteed entertainment. It was a haven, a place to escape too, and once inside, you really wanted to sit through everything the projectionist had to offer. The Bob White theatre brings back the most exciting of memoires for me, more so than any other indoor theater. The screen was massive. Heroes, seen primarily on a small black and white television set dependent on rabbit ear reception, now appeared in living color literally larger than life. When they spoke they spoke in grand voices, amplified by theater speakers. A kid my age could easily fall in love with the leading ladies painted up with their red lips and 60's mascara. A kid my age could easily identify with the muscle bound heroes, wanting to be just like them. For under a dollar, you could see two movies plus load up on popcorn, candy and something to drink. Though the actual admission price escapes me, I do know that it was somewhere between the thirty-five and seventy-five cent range. With popcorn in lap, Pom-Poms in hand, and a Coke sitting on the floor in a giant ice-filled cup, cartoons usually preceded the movie. My favorite place was the balcony. It was great to look down. The feeling always left me with a sense of grandeur, sitting high atop a mountain waiting for the grand presentation. The balconies were usually empty, populated mostly by teenage couples that retreated to the darkness of the upper tier. It always amazed me at how determined they were not to see one minute of the feature film. Playing kissy-kissy could've been done behind the school or in a parked car. Why waste valuable theater moments on girls? They sat in the back, obscured by shadow, and I sat in the very front resting my arms across the front rail, and we all sat blissfully ignorant of each other. My favorite memory of the Bob White is that it was next door to my dad's studio apartment. I mean it was literally just a matter of footsteps to go to the movie! I saw "Man's Favorite Sport. there. I expected this movie to be a dud, and it ended up as one of my all-time favorites to this day. The scene on the floating sleeping bag raft was, and still is my favorite. The scene had me absolutely spellbound by the sheer calm, camping adventure of it all. The movie-for anyone who hasn't seen it, is about a bogus "fishing expert" (Rock Hudson) who has never even picked up a pole before, and is blackmailed into entering a major fishing tournament at Lake Winnipesauke. The Rock was as excellent as ever, and Paula Prentiss re-defined my idea of what the delightful bubble-headed actress should be. Finances being what they were, seeing movies in a theater was a real rareity. 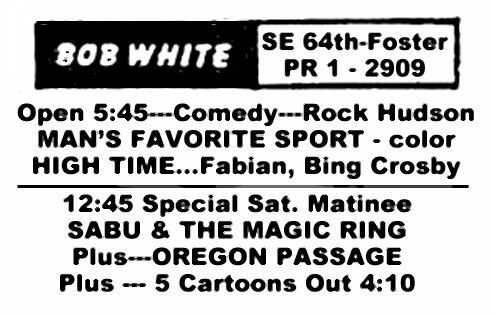 The Bob White was always the Saturday night special whenever I spent the weekend at my dad's. The screen was so huge, I felt like I was there. I also saw "Boeing, Boeing" with Tony Curtis and Jerry Lewis, which was only so-so. Sadly, the early 70's saw the Bob White in decline, showing mostly adult features, and heavy R rated films. Eventually, I lost track of the place until one day, it was no more. My memories of the Bob White live forever on that one special Saturday Night with "Man's Favorite Sport". I wish I could go back again. I wish they could re-open, and show that same movie. I'd sit in the balcony, loaded up with popcorn, and re-visit one of the greatest experiences of my life. My Dad's studio apartment was just above the theater. All I had to do was walk down the stairs and turn abruptly to the right, and I was at the movies!